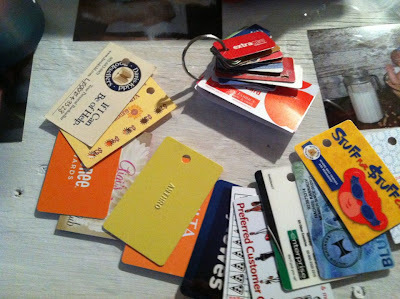 I don't know about you, but I have a TON of frequent shopper cards; Babie-R-us, grocery store, walgreens, CVS, you name it, I probably have it. And they either make my wallet really thick and heavy or they simply junk up the inside of my purse. Either way, it's really annoying! So, here's my simple solution for you....I put them all on a key ring! They fit neatly on the ring and they are easy to find. Best part? I don't have to weigh down the key in the ignition of my car with them and if I want to, I can hand the entire thing to my husband when I send him somewhere. Obviously, this was a bit simple of a simple solution, but for me it was one of those things that I probably should have thought of and never did.